The Binding Stitch is proud to feature the best of its completed projects whether they are from recognized designers or from needle art students around the country. Visit this page often for inspiration and to see what is new. This oval hand-painted box was inspired by a scrimshaw box featuring a chrysanthemum garland on its exterior. Chrysanthemums are recreated in needle art in the interior as lids for interior compartments and as a spray with large monogram on the interior lid. A beautiful hand-painted round box with interior and tray designed for the needle artist. The box exterior features a colonial primitive village with a grained lid. The tray compartments are stitched in bargello with an artist’s verse in the center with a large personalized monogram. 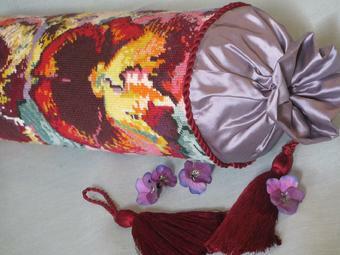 The box interior is lined with exceptional coordinated silks with a turned wood thimble container and pin cushion lid and implements pockets around the edges. A depiction in needle art of Nantucket�s busy harbor area in the 1800�s during the height of the whaling era. Enterprising women supported their families while their sea-going ship�s captains and mates were off at sea for years at a time. 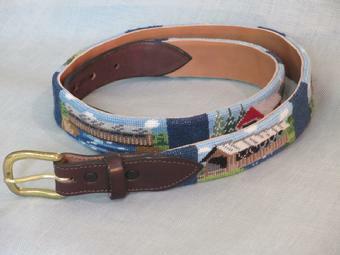 Stitched in 26 silk colors from Thread Gatherer, Gloriana, Weeks Dye Works and more, this design features a 360 degree look at the harbor area all housed in a beautiful 8 X 8� basket in the Nantucket style. Elsie Di Cassio captures a packet ship under full sail passing the 1800's House in Nantucket. 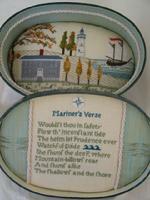 Painted in primitive New England style, the scene graces the lid with hand-grained sides creating a collectible oval painted papier mache box perfect for stitching accessories. Marcia Brown Smith has reproduced in needle art Elsie's painted scene to grace the interior bottom of the box. Rich shades of greens and blues collide in a complementary silk to finish the luxurious box interior. 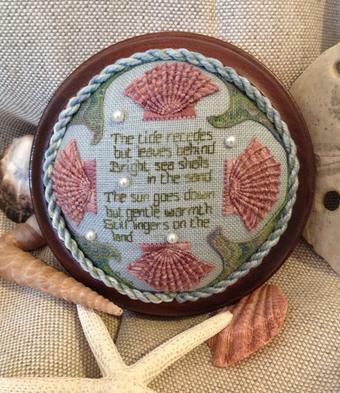 The stitched design is completed on 32 count off-white linen using over-dyed silks, Sampler Threads and floss. A masterful object d'art depicting the glorious sailing days of Nantucket. 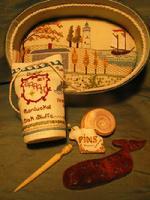 Add this captain’s ditty bag and snail pin cushion to the 1800’s Workbox to complete the ensemble. 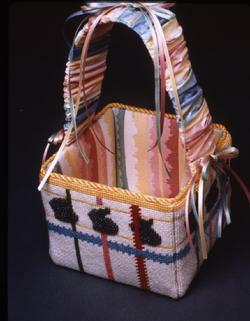 The ditty bag lists ports of call in New England with breeching whale and lobster motifs. The snail pin cushion uses an actual snail shell to house the stitched body with golden antennae. Never is there a more aqueous treasure than this perfectly polished, hinged creamy peach shell case filled with luscious peach silk baby moir�. Inside a thimble nestles within a diminutive stitched linen ribbon band encrusted with pearls from the sea with a cushion of Doctor�s wool for needle storage. Outside, the gold clasp is embellished with a magnificent watery moir� ribbon with picot edge in shades of lavender and peach. 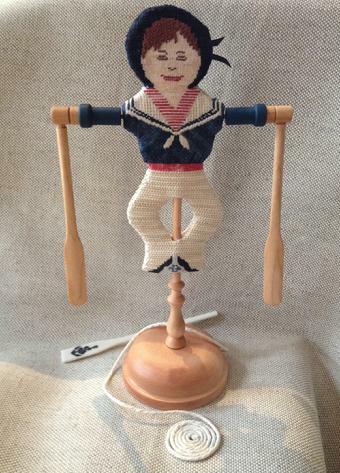 A perfect stitching accoutrement for any stitching mermaid. Create your own classic wine cask filled with exceptional accessories and cork closure, stitchable linen ribbon motifs and distinguished grape and forest silk stripe lining. A custom-made Purple Heart pen is tucked into the linen hinge for noting favorite wines. A Marcia Brown Smith design. Mounting needle art onto furniture pieces requires special skills, but the result is impressive and unique. This antique chest was the perfect vehicle for a beautiful piece of needlepoint set off with coordinating fabric panels and wood trim. 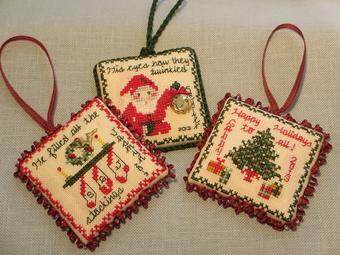 Stitched by Linda Vacant of Massachusetts. 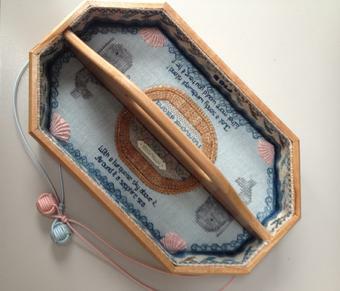 This delightful sailor's etui designed by Tricia Wilson Nyugen is a four-panel container featuring a luxurious silken interior for storage of the stitchers accessories. This charming canvas Easter Basket is easy to assemble and can be altered to reflect your favorite theme. The perfect gift for the man who has everything or the very well-dressed fashionista. 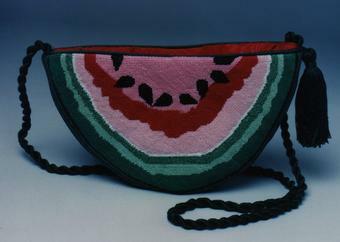 Handbags of every description complete a fashion statement.